MINIVAP VP Vision is a portable and highly versatile vapor pressure tester featuring excellent precision and pressure range of 0–2000 kPa. The MINIVAP VP Vision analyzer is the first instrument that demonstrates excellence in engineering by receiving certificates for durability and robustness. The instrument is based on Grabner’s cutting-edge Cockpit™ technology, providing unprecedented networking capabilities and enabling global access to analyzers. The MINIVAP VP Vision instrument is capable of measuring LPG, jet fuel, crude oil, gasoline, and solvents. 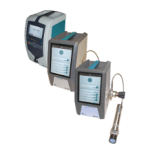 The analyzer offers a broad pressure range of 0–2000 kPa, without affecting precision. Long-term testing has shown an unparalleled repeatability below 0.2 kPa. The recently developed Grabner 2D-Correction™ (273 points) and correct piston positioning assure precise and accurate results over the entire measuring range. 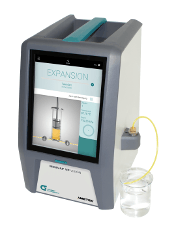 The MINIVAP VP Vision includes Grabner’s Sampling Pro™ valve design, which at the time of ruggedness tests proved to be the premium piston-based design for reducing cross-contamination between different types of samples. 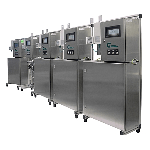 The MINIVAP VP Vision vapor pressure tester exceptionally integrates flexibility with ease of use. A new, app-like user interface makes it possible to select, start, and follow measurements directly on the industry-proven 10” touch screen. Customized techniques can be added and measuring templates can be created with just a few clicks. Furthermore, Grabner’s Cockpit™ PC software provides the utmost in flexibility to lab managers. The software integrates measurement results from several locations. Multiple instruments are automatically recognized with the help of the Cockpit™ PC software. In addition, devices all over the world can be configured, tracked, diagnosed, serviced, and upgraded from a single central laboratory. A secure VPN tunnel allows access to the software, enabling true mobile access to instruments from any place at any time. An exclusive call home function facilitates an easy link to Grabner’s well-trained support team. The MINIVAP VP Vision is the first-ever vapor pressure tester certified to operate in hot, cold, and damp heat climate. It has the potential to resist heavy shocks and vibrations coming from any direction. This instrument is perfect for use in military applications, in mobile laboratories, or in adverse environments. The MINIVAP VP Vision is fully configured to perform all important vapor pressure techniques. Each analyzer has a shaker to offer fast equilibrium for crude oil and V/L ratio tests. Although the conventional VP model is designed to withstand pressures up to 20 bar, a few applications need increased measurement sensitivity for very low-volatile samples. These applications include, for example, the measurement of oils, diesel, or flavors and fragrances. The MINIVAP VPL Vision model is specifically developed for low volatility measurements up to 150 kPa (21.8 psi), showing a measuring repeatability of better than 0.1 kPa for low volatile samples. The MINIVAP VPL Vision model was designed for automating the manual ASTM D2879 Standard Test Method for Vapor Pressure by Isoteniscope for low-volatile samples, which is employed by the chemical sector. The instrument integrates a direct, extrapolated “VOC” technique for measuring absolute vapor pressure of multi- and single-component samples. The direct “VOC” method is a static technique for establishing the absolute vapor pressure necessary for safety data sheets. In addition, the indirect technique helps extrapolate to very low pressures or to temperatures that surpass the instruments temperature range of –100 °C to +300 °C. Both techniques yield results similar to the static ASTM D2879 Isoteniscope technique but do not need sample evacuation before testing. On the basis of GRABNER Triple Expansion Method, air/gases are removed automatically from the measurement result and the composition of the sample is maintained during measurements. 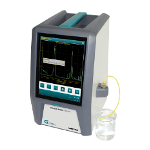 Both the VP Vision and the MINIVAP VPL analyzer include the “VOC”- methods. Since there is a better sensitivity for low-volatile samples, the precision of the VPL Vision is considerably better in the pressure range of 0.1 kPa to 30 kPa.